My most popular post this week was about participating in Haunted Week. It starts on the 24th and is brought to you by This Girl Reads. I reviewed Ally Carter’s second Gallagher Girls book Cross My Heart and Hope to Spy. My family and I met Ms. Carter at the Austin Teen Book Festival, and found her to be very warm, engaging, super (super) enthusiastic and an all-around swell gal. Stacking the Shelves hosted by Tynga’s Reviews is another meme that I participated in for the first time. Now I know what I have to read, and it’s A LOT. I am hoping this will keep me accountable, right? Wow, I am Queen of the Memes this week…I also did Top Ten Tuesday that is put on by the Broke and the Bookish. We had to make a top ten list of authors in any genre. I chose to be super specific by making a list of ten male authors in the Young Adult genre. Next post is an Author Requested Review that I needed to do in August. 🙁 It was for Crimson in the Very Wrong Fairy Tale by Liz Jasper. I was seriously late on this ARR as well – Sam Cruz’s Infallible Guide to Getting Girls by Tellulah Darling. This fun book is now read and posted. Lola and the Boy Next Door by Stephanie Perkins is the last review that was posted this week. I was traveling, so I got a lot of reading done, but was not able to post much. I don’t receive many (OK, any) books in the mail unless I have won them in a giveaway. I get eBooks from authors who want reviews. I love books. I have read The Diviners by Libba Bray and Firelight by Sophie Jordan and will posts reviews for them this week. I have started to read Vampire Academy by Richelle Mead and Me and Earl and the Dying Girl by Jesse Andrews. I will post their reviews this week as well. I love to tweet cool and interesting stuff about books, publishing, grammar, celebutants, writing, TV, random stuff, etc. etc. I am not scheduling any for tomorrow (School holiday! Hooray!) but I will be back on track Tuesday. I schedule things to post at the 40s (no idea why) from 8:40 am until 5:40 pm. I also post in between and later, but those are scheduled. (Unless I am lazy or forget or run out of time.) But please, follow me on Twitter @InkandPage to read some awesome stuff. Since it is almost no longer Sunday, I will stop here. For more awesome reviews and essays and posts, please follow this blog! Thank you! Yay! 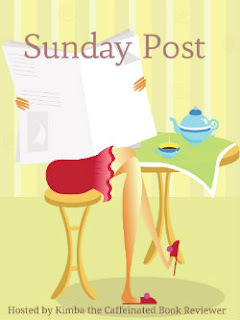 So excited to see you linked to the The Sunday Post You had a great week, and it looks like you had fun with the memes. I usually do WoW and the Post. Looking forward to your upcoming reviews this week. Memes can be so much fun and in this one, I get to see what everyone else is up to. I always love finding new blogs to follow and books to read! Thanks, K.